Ed came to us thinking that he wanted a really simple wedding band, but when we were done with the design of his fiancees ring, he was also hooked on custom designing. Last minute, he decided that he wanted his ring to have that Something that made it his very own. At first glance, this ring looks like a plain flat band. At first glance, this ring looks like a plain rounded band. Hey, wait a minute! 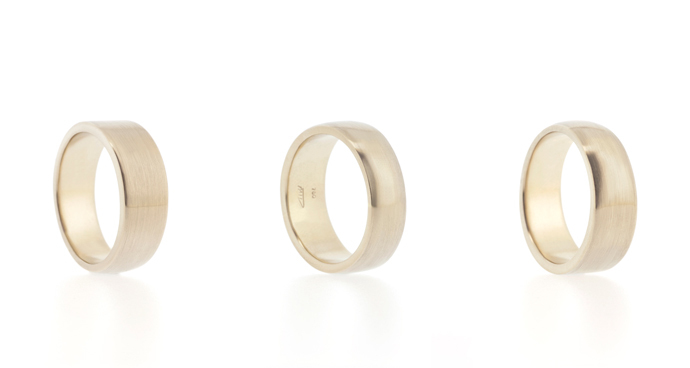 Depending on how you wear the ring, it can be flat, rounded – or half/half. We finished it off with a matte brushed look with polished sides and insides. And of course, Original White Gold. Still a very simple band, indeed. But there is a twist to its simplicity.